York, and Nicky Milner in particular, are to be thanked for taking on this task and for the important archival responsibilities they, along with ADS (Figure 2), have undertaken, in particular in creating PDF's of all back issues of MM. My comments in this invited review are not in any sense critical of Milner and colleagues, but attempt to ask wider questions about what exactly is it that York, acting at the bequest of the Mesolithic symposium, have 'started up again'? 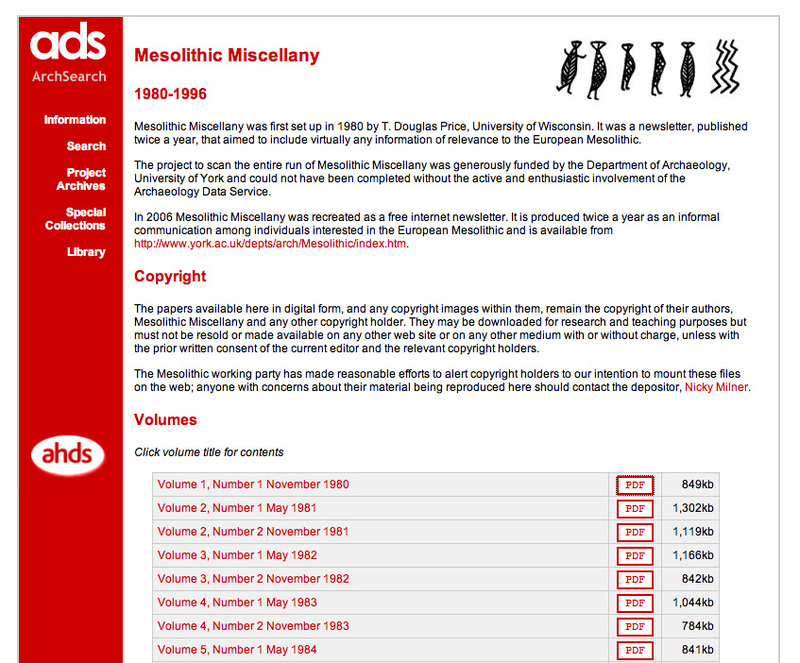 Figure 1: The new Web interface for Mesolithic Miscellany. The closest to a mission statement for MM came in its very first editorial. "MM is now a recognized activity of the Mesolithic Commission of the Union Internationale des Sciences Prehistorique et Protohistorique (sic)... 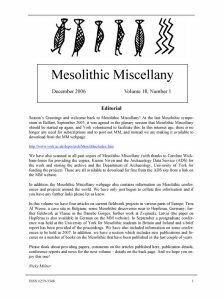 Virtually any information of relevance to the European Mesolithic is welcome within the page of the newsletter" (MM 1.1, p1). In practice, the early editions of the newsletter were dominated by very short contributions, some statements of field results, reviews of research in regions/nations, round-ups of recent publications etc. The collating of lists of recent publications was seen as "one of the more useful sections" (MM 2.2, p1). In this, of course, MM was a product of its time. Mesolithic research was entering a boom period, with a young and enthusiastic generation of (mainly male) scholars across Europe forming a powerful network of colleagues and friends. The Mesolithic in Europe International Conferences (MEIC) were invaluable in this regard, providing a framework whereby people could meet. In this respect it is important to note that Mesolithic archaeology in 1980 was, to say the least, somewhat less populated and popular than today. The research communities within Mesolithic scholarship were truly trans-national in a way that was not true of other periods. MM, with its emphasis on keeping one up-to-speed with different regions and with scattered publications, played a key role in maintaining this pan-European focus of Mesolithic archaeologists at a time when information transfer was conditioned by a different technological and political world. 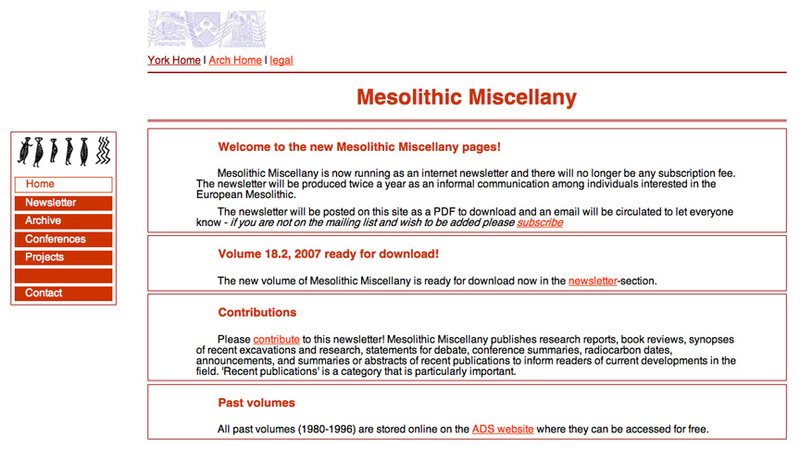 Figure 2: The original Mesolithic Miscellany newsletter archive, now being made available online by the Archaeology Data Service. But what of today? Much has changed, and many of the bright young things who drove the development of MM and the MEIC are now the senior figures in the discipline; some have retired. Times move on and so do people - the plenary session of the recent MEIC, held in Belfast 2005, included photographs from the first symposium, and a well-founded plea from Douglas Price that an archive of memories and images of these symposia be created. A history of this period is needed. Today there is talk of a re-established UISPP Mesolithic commission, although the function of this institution is not clear, and it is interesting that MM is being reborn at the same time. In the early 21st century Mesolithic research is vibrant and healthy across Europe, to the extent that, for example, in Ireland in 2007, the Royal Irish Academy and the Discovery Programme can host a one day seminar entirely devoted to Mesolithic research in Ireland including 13 papers and 16 speakers. The 2005 Belfast MEIC was attended by over 250 people and over 140 papers. 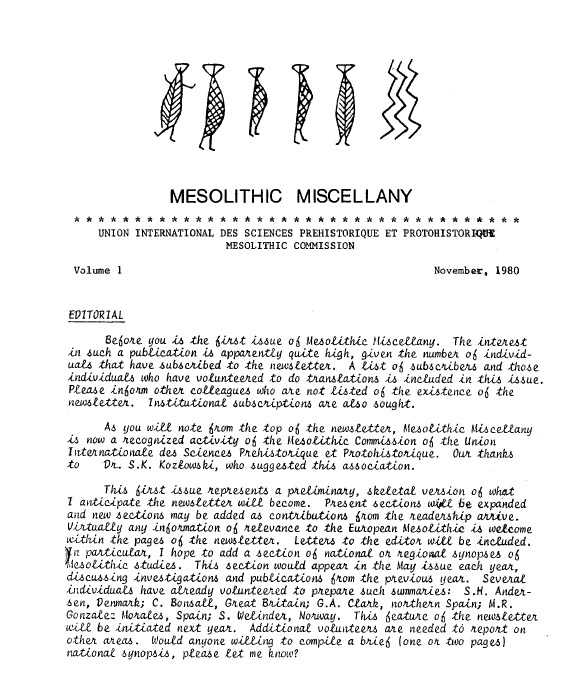 The publication of the 2000 MEIC ran to over 700 Oxbow pages, and only stringent restrictions on length for the forthcoming publication kept it within one volume. The Mesolithic in Europe research community is a great one to be involved in and the 5 year conferences are significant chances to meet colleagues (although impossible to imagine a 5 yearly Neolithic in Europe conference). But we must at some stage face up to the hard truth: the quantity of Mesolithic research in Europe is overwhelming and it is impossible to keep on top of the subject in the way it might have been possible to 20 years ago. Given this, a newsletter devoted to "any information of relevance to the European Mesolithic" is setting itself a tricky task. Even basic questions of definition are obscure: where does Europe stop? Turkey would like to become a member of the EU. Should it join the Mesolithic in Europe community as well? At the risk of sounding parochial, let me ask two hypothetical questions, in each case assuming that the researcher has limited time. Person A researches the Mesolithic of Malta. Should they read about comparative sites in Ireland or in Tunisia? Person B researches Northern Scotland. Should they read about Malta or about Kamchatka? And what kind of paper from Malta or Kamchatka would they benefit from reading? Of course, the question is misleading because the researcher needs to know what is in the papers before they can decide whether they are going to be worth reading or not. Once we assume that we cannot read everything about Europe, wherever it stops, difficult questions about the 'Mesolithic in Europe' as a research community are raised. MM, it seems to me, needs to address these questions if it is to re-think its role in assisting that community. Figure 3 (left): The look of the original printed publication, from 1980. Figure 4 (right): The look of the current publication, now only available in digital format. Barring greater use of colour and a greater restraint from fancy typefaces (Figure 3), the reborn MM is directly comparable to the very first newsletters in style (Figure 4). Content is also familiar and includes reviews of excavations (much, much longer than they used to be, and in 18.1 covering Austria, Latvia and the Iron Gorges), discussion pieces (also much longer), and notes on recent publications. The most significant difference, it would appear, is in the length of articles, perhaps reflecting the modern obsession with referencing and specialist detail even in a newsletter. National reviews do not appear at present, although to me this could be a most valuable function (parallels exist for example in Lithic Technology). It may also be worth noting that although making use of 'this internet age', MM is essentially a paper publication available online; using the web as a mechanism for giving access to a PDF and thereby passing on print costs to the reader and alleviating the need for subscriptions. 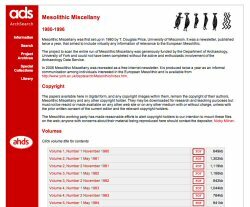 Barring some use of supplementary materials, and in common with many archaeological publications, MM makes very limited use of the structural possibilities of the web-based publication. MM, of course, both serves its community and is served by its community: it can only publish the papers that it receives. 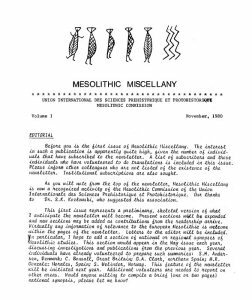 As Milner requests "Mesolithic Miscellany can only operate successfully if you provide information on Mesolithic studies... any research reports, book reviews, conference summaries, radiocarbon dates, announcements, recent publications etc." (MM 18.1, p20). In the next edition, information on excavations has been requested (MM 18.2, p1) and this raises further issues. 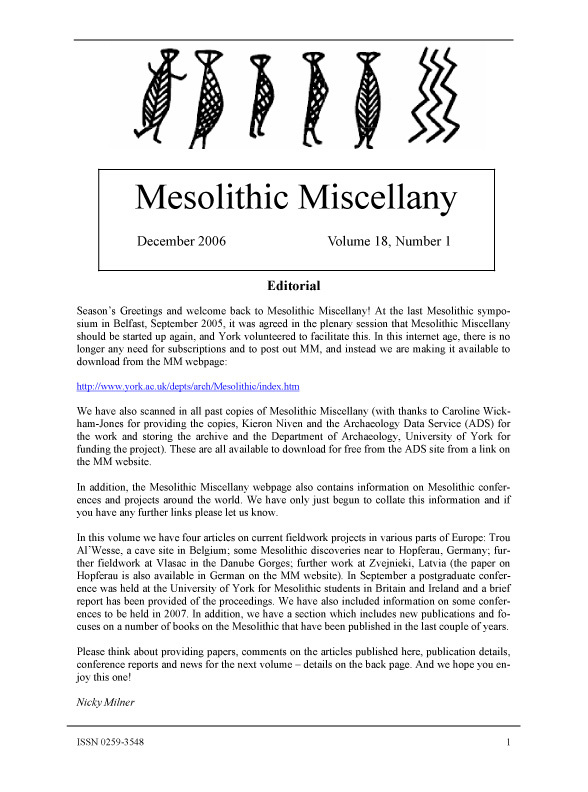 Is MM a newsletter, perhaps akin to PAST, the newsletter of the Prehistoric Society, or is it a journal? Certainly the length of papers in the new MM and the depth of referencing suggest more than 'news'. Karen Hardy's discussion of starch in the European Mesolithic (MM18.2) is 3,500 words of discussion and four pages (!) of references. Given RAE and related pressures it may not be realistic to imagine that MM can sustain articles of this kind, as many will wish to see work of this scale published in more prestigious journals. (No mention of refereeing strategy is made in MM's section for contributors). This is not to suggest that MM should aim to become a fully refereed international journal, but it does suggest that if it is to sustain its new lease of life it must ask questions of what the European Mesolithic community is prepared to contribute, and ways in which this can be sustained. Is MM actually a home for interim reports or should we think of short notes on current projects (fieldwork or otherwise) providing links to the (on-line) stratigraphic or other reports that we are obliged to produce annually anyway? Why not change tone entirely, drop our obsession with referencing and make this newsletter a home for short pieces devoted to debate and news? Book reviews are essential to any community, and would make MM a key reference point for students, thus encouraging them to encounter the cutting edge of Mesolithic research. If MM is to be a newsletter for a community then it should play a role in fostering that community. This, in turn, may require the community to become more active in that interaction. This happens in discussion at conferences, but truly European meetings are rare, perhaps only one a year. Some kind of Mesolithic discussion board or list, managed through MM, would be of use, where researchers could raise queries (object types, feature types, ways of dealing with x/y/z, "has anyone tried this? ", "who should we contact?"). Such discussion boards could foster research partnerships. Key issues arising from short newsletter pieces could provide departure points for debate. As I stated at the outset, my aim in this review has not been to be critical of the work Nicky Nilner and her colleagues have carried out in bringing MM out of its hibernation. The reappearance of the newsletter is very welcome. Milner and colleagues acted on behalf of the Mesolithic community and there was very general acquiescence in the plenary session at the suggestion it return. Yet the research community gave nothing by way of direction for the new MM, and, arguably, there is now a mismatch between the form of the newsletter and the current research and academic context. I hope the comments made in this review are seen as a contribution towards rethinking the role MM plays in fostering this research community. I would argue that MM should move towards shorter articles and a true newsletter style, rethink the format and make greater use of web publication. Certainly a discussion board/mailing list should be considered. The newsletter should be populated by shorter reviews of key issues in regions/nations/specialist fields, and I suggest these should not be referenced to facilitate production, opinion and speed of production? MM might consider a 'podium' as used in many news-based publications. Book reviews (critical to promoting debate), conference reviews and museum reviews will remain vital and fieldwork updates are an important aspect of the newsletter, but these should be short, not full interims, and they should make links to resources elsewhere. MM can play a central role in the Mesolithic research community of the 21st century, but it may have to re-imagine itself first. Thanks to Killian Driscoll and Aimée Little for discussion.